You’ll need a basic working knowledge of Excel, including things like SUM formulas, entering data, adding sheets etc. If you’re not yet at this level, check out my ‘Getting Started with Excel 2013’ course. Welcome to Microsoft Excel – Become an Excel Guru, where you are going to learn everything you need to know to become an Excel expert. 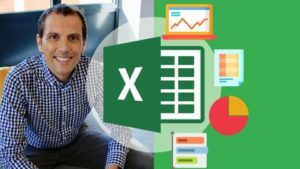 After working for a decade of training in some of the biggest UK companies and over 13,000 students online, I am here to teach you how to excel with Microsoft Excel. From using Excel formulas and Pivot tables you will learn the fundamentals of data analysis but also how to automate tasks using Excel VBA and some great data presentation tips and tricks. The first module covers working with data in Excel, where you’ll learn all about how to structure your data, clean it and enrich it using Excel formulas and how to get the best out of the Excel tools such as adding styles and dropdown options to cells. It’s the first step on your way of working faster and more effectively! The second module is all about data analysis in Microsoft Excel. In this module we take a deep dive onExcel pivot tables – a powerful way to slice and dice your data and really uncover the key trends and insights. Module three covers presenting your data analysis, with the key focus on learning how to create great looking management reports and Excel dashboards. Being able to present data analysis in a succinct Excel dashboard is a skill that can really take your career to another level. In the final module, we’ll cover Excel VBA, automation in Excel using Microsoft’s coding language sometimes called Excel Macros. One of the easiest coding languages you can possibly learn can help you automate away repetitive and boring tasks you do in Excel. Are you ready to take your Microsoft Excel skills to the next level? Course access includes comprehensive workbook with examples, 1-on-1 tutor support, lifetime access and a 100% money-back guarantee! This Microsoft Excel courses will take you through 4 of Microsoft Excel topics (Data, Analysis, Presentation & Automation).